2. Fundamentals of 2D materials vis-à-vis graphene. Dr. C.S. Rout & Dr. D.J. Late, Density of states, Synthesis, devices, contacts, band alignment, surface and interface physics, intercalation, etc. 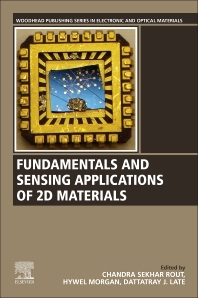 Fundamentals and Sensing Applications of 2D Materials provides a comprehensive understanding of a wide range of 2D materials. Examples of fundamental topics include: defect and vacancy engineering, doping and advantages of 2D materials for sensing, 2D materials and composites for sensing, and 2D materials in biosystems. A wide range of applications are addressed, such as gas sensors based on 2D materials, electrochemical glucose sensors, biosensors (enzymatic and non-enzymatic), and printed, stretchable, wearable and flexible biosensors. Due to their sub-nanometer thickness, 2D materials have a high packing density, thus making them suitable for the fabrication of thin film based sensor devices. Benefiting from their unique physical and chemical properties (e.g. strong mechanical strength, high surface area, unparalleled thermal conductivity, remarkable biocompatibility and ease of functionalization), 2D layered nanomaterials have shown great potential in designing high performance sensor devices. Dr. Chandra Sekhar Rout is a member of the faculty at the Indian Institute of Technology Bhubaneswar, India. He did his postdoctoral research at National University of Singapore (2008-2009), Purdue University, USA (2010-2012) and UNIST, South Korea (2012-2013). He joined IIT Bhubaneswar in 2013 and he is actively involved in both research and teaching of undergraduate and graduate students there. His research interests include preparation and characterization of two-dimensional layered nanomaterials and their nanocarbon hybrids for chemical sensors and biosensors, supercapacitors and energy storage devices, field emitters and electronic devices. He has authored or co-authored more than 100 research papers in international journals. He has been awarded prestigious Ramanujan Fellowship and Young Scientist award of Department of Science and Technology, Govt. of India in 2013, Young researcher award from Venus International Foundation, India in 2015, IAAM medal 2017 and emerging investigator award 2017. He is an associate editor of “RSC Advances” a journal of Royal Society of Chemistry and “American Journal of Engineering and Applied Sciences” of Science Publications. Dr. Dattatray J. Late after completing his PhD with Prof. D. S. Joag, he worked as a DST Post-doctoral Fellow on Nanoscience & Technology with Prof. C. N. R Rao at JNCASR, Bangalore (2008-2010). He currently holds the position of AcSIR Assistant Professor, Scientist, and DST Ramanujan National Fellow at CSIR-National Chemical Laboratory, Pune. His current research interests include synthesis of atomically thin nanosheets of inorganic layered materials for nanoelectronic device applications, catalysts for water splitting, H2 generation, etc., and Raman spectroscopy. He has authored or co-authored more than 140 research papers in international journals. Dr. Hywel Morgan is a Royal Society Industry Fellow and Deputy Director of the Institute for Life Sciences at the University of Southampton. After a post-doc position at the Hebrew University of Jerusalem, Israel, he moved to a lectureship at the University of Glasgow in 1993 and was appointed Professor in 2002. In 2003 he moved to the University of Southampton, where he is Professor of Bioelectronics. In 2001 he was awarded a Royal Society-Leverhulme Senior Research Fellowship and in 2004 won the Desty award for innovation in separation science. He has published widely and co-authored a textbook on AC electrokinetics. He is a Fellow of the Institute of Physics and the Royal Society of Chemistry. He holds a Royal Society Wolfson Research merit award.